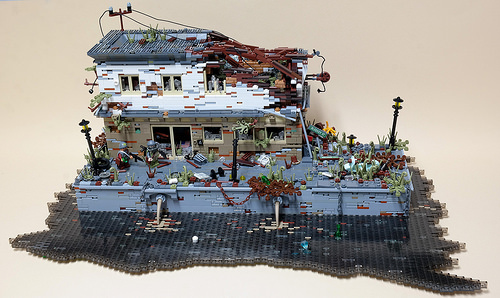 What’s not to love about a post-apocalyptic toxic wasteland? Bleecker Street never looked so bleak in this delightfully dreary scene built by Sanel Lukovic, part of a collaborative build presented at Bricking Bavaria in Munich with friends Robert Maier and Jonas Obermaier. Simply titled Apoca, it has a lovely rustic, decaying motif. Broken windows throughout the dilapidated building contrast with the charming copper oxide green Vespa, while overgrown weeds and cluttered wreckage cover cracks in the pavement. And nothing screams post-apocalyptic like respiratory equipment being worn by the armed and dangerous-looking dudes surveying the badlands.